HP goes Android: what does that say about Windows 8? Here at Mobile World Congress in Barcelona HP has announced a 7” Android tablet which will be available in April. I took a quick look at the Mobile Focus event today. The back of the device is more interesting, showing logos for HP and for Beats Audio. From the front you would be pushed to distinguish it from, say, Google’s Nexus 7. Black screen, runs Android. I asked the guy on the stand what is distinctive about HP’s little Android slate in a crowded market. 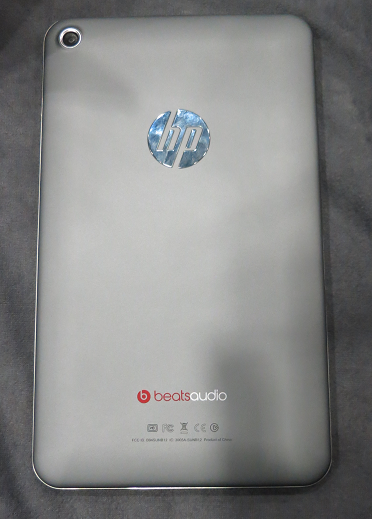 He said it had above average build quality, above average sound thanks to Beats Audio (you can find this discussed here), and support for HP’s printing system. Not much, in other words; but the more interesting question is why HP is doing this. One reason is price. This will be a relatively cheap device, substantially less than any of HP’s windows machines, and without it HP would have little to no presence in the consumer tablet market. Why not a Windows RT or Windows 8 device? That is the heart of it, and more interesting than the slate itself. HP is not giving up on Windows tablets, but it is positioning them more as business machines whereas the new slate is a consumer device. The problem is that Microsoft has so far failed to make Windows 8 viable for this kind of market. It is too expensive, too peculiar, and there are too few worthwhile apps. That, and the Windows Runtime platform is not yet good enough, as developers at the sharp end discover. This means that HP has little choice but to go Android. The form factor is also a problem. 7” seems to be beyond Windows Phone 8 territory, but too small for Windows 8 or RT bearing in mind the desktop and Office aspect. It is an awkward gap in the Windows offering. The impression I got from several vendors at the show is that Microsoft is on the right lines with Windows 8, but the first release is disappointing on the tablet side. What if HP starts to experiment with Android tablets that can be used like laptops, with neat keyboard cases and office-style applications? In the end the market will decide on the balance between Android and Windows, with the signs currently that Microsoft will struggle to gain momentum in the consumer tablet market. At this point I don’t see Google / Linux attacking MS on their home turf – enterprise computing. The current IT department lock-in stems from skills & infrastructure built around MS Office & the NET framework. Canonical has done an amazing job with Ubuntu & LibreOffice – It is a viable competing platform & is just a saner economic choice than WIn8 + Office 13 licensing in the workplace. Likewise, Google is not exactly ratcheting up the marketing engine for ChromeBook & Google Docs in the enterprise. If Canonical solves its UEFI issues, and both Canonical & Google start marketing their competitive platforms, then MS could be in serious trouble: Instead of guarding their enterprise hen-house (which they have deemed ‘legacy’), MS is focusing on an uphill battle in the consumer market.